Crossover stitch is the latest of my new stitch patterns. Another stitch from the 1930’s, Crossover stitch has lovely columns of faux twisted stitches between columns of eyelets. You can see my swatch biases a little to the left, but if you use needles a couple of sizes larger than you normally would for your chosen yarn, the stitches become stable and won’t lean. 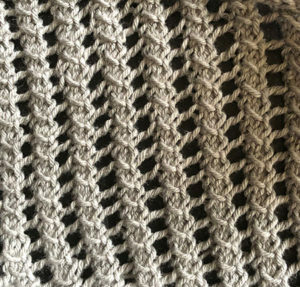 With only two rows, this stitch is super easy to memorise for on-the-go knitting and would be beautiful worked in a panel up the centre front on a top, as an all-over pattern on a stole, or in an afghan square, surrounded by seed stitch. Next Next post: Wave that Flag!